The United States Mint began taking orders for its most popular bullion American Eagles on Monday, January 3, 2011. 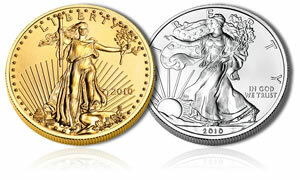 2011 American Gold Eagles and 2011 American Silver Eagles will begin making their way into the secondary market within days. US Mint Authorized Purchasers started the new year by ordering 8,500 of the one-ounce 22-karat Gold Eagles and 1,696,000 of the .999 fine Silver Eagles. A portion of those totals include old 2010-dated inventory as the US Mint is requiring its AP’s to purchase them proportionally until their supply is gone. Currently, the US Mint is only offering the one-ounce 2011 Gold Eagles. Similar to last year, the fractional sizes — the one-half ounce, one-quarter ounce, and one-tenth ounce coins — will be available later in the year. The US Mint is off to an earlier and more normalized start this year. Last year’s 2010-dated bullion coins were released on January 19, with the previous year’s 2009-dated issues produced until December 31 and sold until January 12. Traditionally, the US Mint had produced newly dated bullion products around November to have them in ready supply for their buyers in early January. 2009 was unique as high demand and low coin planchet supplies resulted in a production extension for the 2009’s and the delayed release for the 2010’s. All US Mint investment-grade bullion products are sold directly to its network of Authorized Purchasers who resell them to coin dealers, precious metals sellers and others. Most AP’s do not sell coins directly to the public, with the exception of the new America the Beautiful Silver Bullion Coins which the Mint now requires them to sell only to households. Bullion coins lack the collector proof and uncirculated finishes and do not have the West Point (‘W’) mintmark on their obverse side. The US Mint has announced preliminary release dates for its collector American Eagles. It indicates the 2011-W Proof American Gold Eagles will be released on April 21 and the 2011-W Uncirculated American Gold Eagles on May 5. Release dates for the proof silver versions are less exact. The US Mint schedule has the 2011-W Proof American Silver Eagles available "by July 6." The uncirculated version has a "To Be Determined" date. When available, these collector coins will be sold directly to the public through the US Mint website and its customer service phone lines.